The Complete Meat Cookbook, pp. 525-26. I came home from Europe flattened by a cold and ready for spring. While I was gone, my new vegetable garden took shape. I’m itching to get out there and plant, but for the past week my head and my lungs have battled to expel so much gunk that I could barely drag myself out to the deck to gaze over my rapidly developing urban farm. So, the time has not yet come to abandon wintery food. 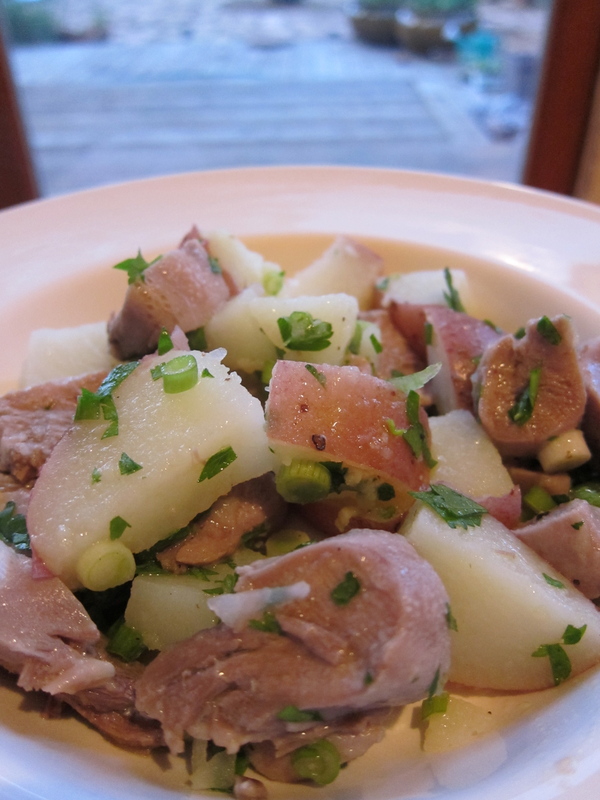 I defrosted the lamb tongues my sheep-raising friends gave me before I left for Europe. In Aidells’ indispensable book, I found a recipe that recalled to my mind a lamb tongue salad I once had at the incomparable Bistro Jeanty in Yountville. After I had it for dinner, I thought it fell short of what it could have been. Hearty, but bland. What should I do next time? Make the dressing slightly creamy with mustard? More lemon? The Bistro Jeanty version incorporated the crunchy leaves of butter lettuce hearts. This version could stand more crunch. I’ll have to think about it. Suggestions welcome. 1 lb lamb tongues or a 1-lb piece of lean, boneless lamb shoulder, trimmed of all fat. Shadowcook: I had 6 lambs tongues that together weighed a pound and a half. They did not amount a lot of meat. Shadowcook: Or two heaping teaspoons kosher salt. But the entire recipe needed far more salt than called for. To prepare the lamb: Wash the meat and place in a large kettle with the remaining ingredients. Bring to a boil, reduce to a simmer, and cover. Simmer lamb tongues for 2 to 3 hours, shoulder for 1 1/2 to 2 hours, or until the meat is quite tender. Remove the meat, discard the vegetables, and let the meat cool, covered in the stock. Save the stock for soup. When the tongues are cool enough to handle, make a long slit starting from the base. With your fingers, peel away the skin. Or tim the shoulder of any fat or gristle. Cut the meat into 1/4-inch-thick sliced and reserve. Shadowcook: Two hours were sufficient to make the six tongues very tender. I removed the tongues from the stock, let them cool for a few minutes, and then peeled them. The warmer they are, the easier they are to peel. After slicing them up, I put them in a bowl and poured some of the still hot stock over the meat to keep it warm. Whisk all the ingredients together in a bowl or pulse briefly in a food processor. Gently toss the meat, potatoes, parsley, and green onions with the dressing, preferably while the lamb and potatoes are still slightly warm. Add salt and pepper to taste. Serve at once.